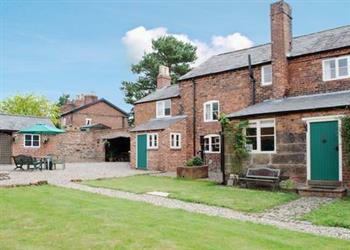 Smithy Farm in Dunham-on-the-Hill, near Frodsham sleeps 7 people. This 18th century, semi-detached holiday farmhouse is located in the quiet village of Dunham-on-the-Hill, just 6 miles from the historic city of Chester. The village is mentioned in the Domesday Book and has a café and pubs. A wider range of amenities can be found in nearby Helsby or the market town of Frodsham (market on Thursdays). Cheshire Oaks Designer Outlet Village is within easy driving distance. The accommodation is well proportioned and combines original features including a fantastic outdoor covered hot tub and games room. With such great facilities on site it is tempting to just stay home and relax, but with so much to see and do in the area its just not an option. Smithy Farm offers something for everyone. Walkers and cyclists will enjoy exploring the beautiful Cheshire countryside, walks include Helsby Hill and quarry walks, whilst those who prefer a city landscape are ideally placed for commuting into Liverpool and Manchester. There is also a bus service from the village into Chester. There are lots of local attractions for families including Chester Zoo, Blue Planet Aquarium and Delamere Forest’s Go Ape adventure. Other activities available locally include numerous fisheries, golf (Helsby), and horse riding. Watersports fans will enjoy Manley Mere which offers windsurfing, sailing and kayaking as well as having an adventure trail. Cheshire is also a food lovers paradise with lots of great restaurants and pubs nearby including Marco Pierre White’s restaurant, which is less than 6 miles from the village. Shop 2 ½ miles, pub and restaurant ¼ mile. Ground floor: Living room with beams. Dining room with beams. Kitchen with tiled floor. Games room. First floor: 3 bedrooms: 2 double, one with en-suite bathroom with shower over bath and toilet, 1 single. Bathroom with bath, shower attachment and toilet. Second floor: 1 double bedroom. Gas central heating, electric, bed linen and towels included. Travel cot. High-chair. Freeview TV. DVD. Electric cooker. Microwave. Washing machine. Freezer. Wi-Fi. Large lawned garden with patio, sitting-out area and furniture. Bar-be-que. Ample parking. Cycle store. Hot tub. Games room with pool table. Table football in dining room. No smoking. Holidays run from Friday to Friday. For a better idea of where Smithy Farm is, you can see Smithy Farm on the map below. Smithy Farm is in Cheshire; should you be on the lookout for a special offer, you can find all the special offers in Cheshire. It's always worth checking to see what is on offer at the moment. Do you want to holiday near Smithy Farm (28703), you can see other cottages within 25 miles of Smithy Farm; have a look to find your perfect holiday location.